The latest release of the OCSlim project has integrated FitNesse test reports along with XCTest framework. In this post, we will see how to integrate Fitness with XCTest. Recently FitNesse has entered into the world of iOS development. An OCSlimProject has enabled an ATDD and BDD practices in iOS development world. This project enabled us writing and blazing fast acceptance test with FitNesse for iOS. Thanks to Paul Stringer and other contributors. You can read more about what are the problems that FitNesse can solve in article ‘Acceptance Testing for iOS‘ by Paul Stringer. As of now FitNesse acceptance for iOS running in the separate process and reports are generated by a different mechanism which doesn't feel like FitNesse and is actually part of the development and CI workflow. The good news is the latest release of the OCSlim project has integrated FitNesse test reports along with XCTest framework which means we can execute FitNesse tests along with Unit tests using Xcode-build. In this post, we will see how to integrate Fitness with XCTest. Once we've got these we are good to go. Let’s create a new Xcode project in Swift with Unit tests only, without UI Tests and Core Data. Let’s build this project and run unit tests for the blank project by pressing CMD+B and CMD + U. Now we have a blank app running in the simulator. Now we have all the necessary targets templates copied over to Xcode. 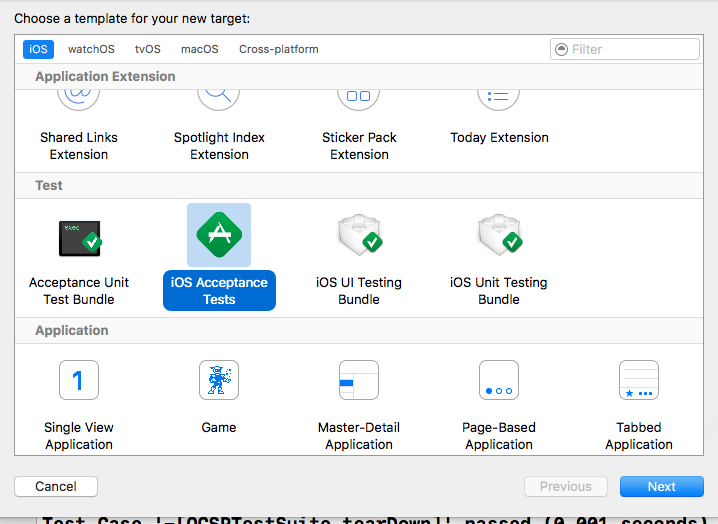 Now Launch Xcode and Select new Targets for iOS. You will see Acceptance and Acceptance Unit Tests Bundle got added to Xcode. Now that we have all the predefined targets for FitNesse. Just add “Acceptance Tests” target from the template and “AcceptanceUnitTests” target from the bundle. You will need “FitNesse Suite page name” to create this target but just put “OCSlimProjectExamplePage” there for now . Add your ‘AcceptanceTests’ target as a ‘Target Dependancy’ of this new target in Build Phases. This ensures that it the latest code has been built prior to the tests being run. If you click build at this stage, it will fail because we don’t have Pod dependencies added yet. Just Click on ‘Edit-> Convert-> To Current Swift Syntax and this error will go away. 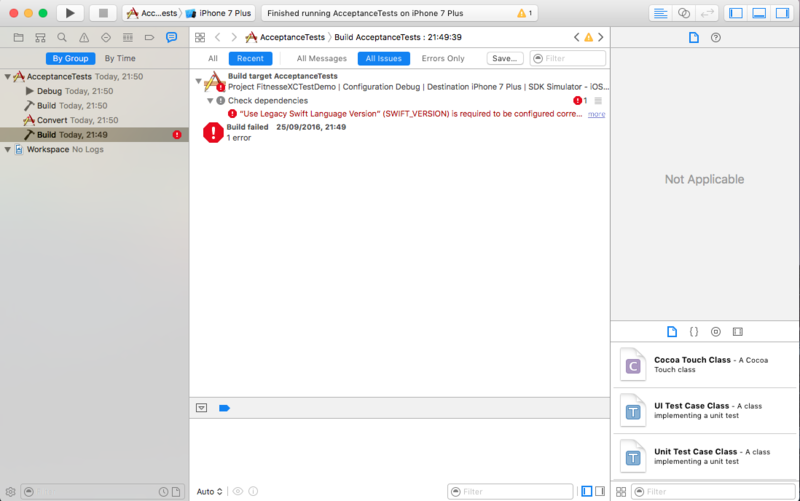 Now that , we have seen how to run FitNesse acceptance tests from Xcode but it’s a good idea to run it with Fastlane. We can also take control of version of Cocoapods and Fastlane by using Bundler. Let’s create a Gemfile at the root of the project with the following gem. desc "Runs all the Unit tests and Fitnesse Aceptance Tests"
Now we will create a “fastlane/PluginFile” to add “trainer” plugin. The Source Code for this demo is available on Github “Fitnesse-XCTest“. Just run following commands? In this way, we can execute FitNesse iOS Acceptance test as part of our development workflow along with our unit tests. This allows us to get early feedback and seamless integration with IDE like Xcode8.